I previously wrote a post about my pet crested gecko Lex. She was an intentional pet - I researched the species and care requirements and decided that we would be a good fit. I also have an unintentional pet, however. 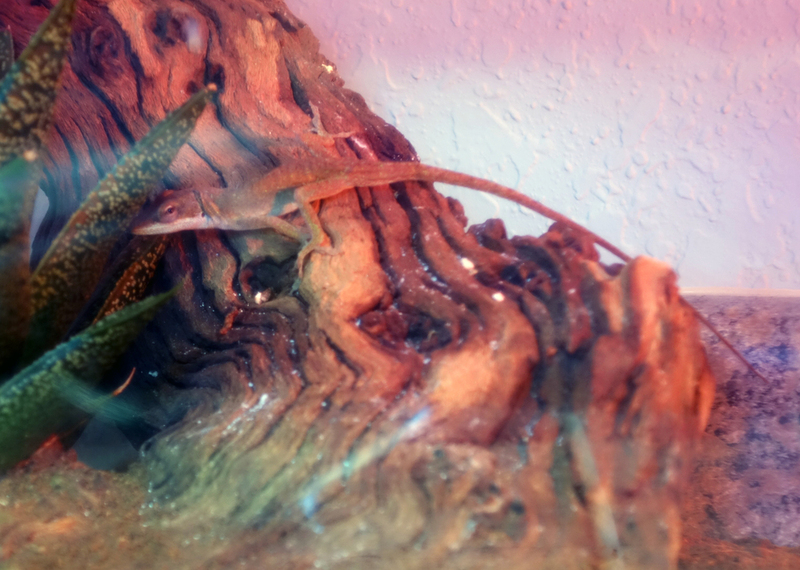 His name is Marvin, and he is an anole lizard. There's a fair amount of backstory, so if you just want photos, go ahead and scroll to the bottom. While I was pursuing my MFA at LSU, I spent my final two years in the program obsessively researching, painting, and sculpting anole lizards. I even contributed to a zoological research blog called Anole Annals about anoles. Viewers of my work would frequently ask me if I had any as pets or if I was intending on bringing live anoles into my gallery installations. To the first question, I responded that I preferred to see them thrive in their natural environment - I had kept a couple anoles as pets when I was younger, but I did not have the type of setup to keep them well and as I matured I felt ashamed of my poor treatment of them. Anoles are surprisingly complicated pets in that they require a heat lamp, frequent misting, and fairly continuous access to live insects. They are also more skittish than other types of lizards including bearded dragons, iguanas, and crested geckos, and that causes them stress when forced to interact with humans in captivity. To the second question, I answered that I also didn't want to bring cages or the idea of pets into my work because my focus is on nature and ecological balance. And I wasn't going to harm anoles by releasing them sans cages into the gallery to desiccate/starve/be poisoned/etc. After completing my MFA and accepting the job offer at USM, I began to pack up my belongings for the move. I would need to drive myself up to Kansas from Baton Rouge because of my houseplants (many of which lived on my porch due to the tropical weather). I had slightly fewer than I have now, but I still had around 70, and the movers wouldn't take live plants (and I didn't want them to as they really weren't equipped to transport them safely within the contract structure we negotiated). So I Tetris-ed my plants into my car and drove north. When I arrived at my house, I unpacked them all and left the bulk of them on my new porch for the rest of the summer. It was July. Come late October, the seasons were switching and a frost was forecast. I pulled all my houseplants inside to wait out the winter. A couple days later, I was tidying the houseplants up (bringing them inside invariably also brings in dead leaves and grass, stinkbugs, spiders, and so on) and I heard a rustle and then an anole popped out of one of my larger bromeliads and ran partially up the leg of my drafting table. I stood frozen for a minute, wondering how in the world I was going to catch a wild anole in my house who was already nervous enough to hop out of his plant instead of nestling further down. I went into the kitchen and got a thin glove so as not to let him spook me into dropping him if I did manage to catch him, and then began what I assumed would be a very protracted and ultimately futile attempt. I slowly walked up to the drafting table and then shot my hand out... and caught him immediately. I popped him into a plastic storage container and then looked up pet stores in Leavenworth. There was one less than ten blocks from my house, so I drove there right away and bought a cage and coir bedding for him. I happened to own a heat lamp already, and over the next few weeks I added driftwood, a sunning rock, a live Haworthia, and other accoutrements to his cage. I had a new pet. There really wasn't another option; he would have desiccated or starved left to his own devices in my house, and he would have frozen or starved if I put him outside. And really, this felt fated - he was more than a pet, he was a totem. The odds of him safely and successfully hitchhiking a ride up to Kansas and then living all summer without moving out of my porch plants only to reveal himself fairly quickly and allow himself to be caught when he needed assistance... the way in which he entered my life as a bridge between my graduate studies and my broader subject matter and between the two geographic locales... 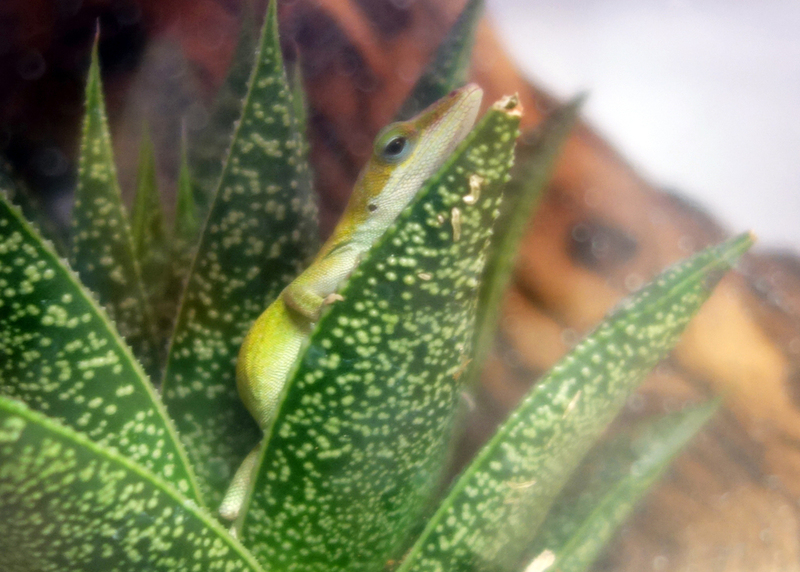 I was meant to care for this anole. Probably due in part to having been wild, I learned in those first couple weeks that though our situation was fated, he wasn't too happy with such a fate; he was constantly brown despite being a green Anolis carolinensis and preferred I not look at him. Because he was such an audacious hitchhiker (and because I love Douglas Adams), I decided to name him from The Hitchhiker's Guide to the Galaxy. A grumpy, constantly-unhappy-but-required-to-stick-around male companion - clearly his name was Marvin. I'm not sure quite how old Marvin is now, but he's definitely reaching the upper range of his projected lifespan. Given that he was hitchhiking in July 2013, he's likely at least three years old already, but he could be even older than that. 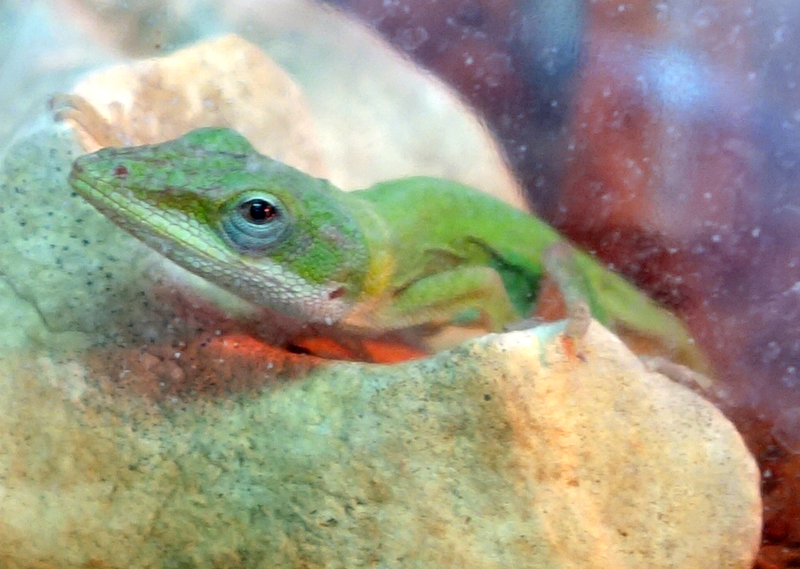 Captive anoles can live to be five to seven years old, so I hope he has another several years in him, but he did have enough of a wild life prior to living with me that he could have picked up parasites or similar stressors that contribute to the shortened wild anole lifespans that rarely top three years. Last summer, I had to bring Marvin to the vet to have a cyst/tumor aspirated that had grown on his neck; I was pretty certain he was going to die from either the cyst/tumor or an infection introduced by the aspiration or from the stress of it all, but he seems to have rebounded. How he got the cyst/tumor in the first place, though, is unclear and it already seemed to recur once but fortunately then went back into remission. Though I didn't set out to have an anole, this anole set out to have me and I will be very sad when he passes. For now, he's still being his adorable, grumpily-brown-90%-of-the-time self. I did manage to sneak a couple photos of him in his green state over the years as you can see below, but the middle photo is more representative of his general mood.